Location Ellerton Scar West of Spring Scar Wood. Geology Detached rock stack at top of Main Limestone Scar. 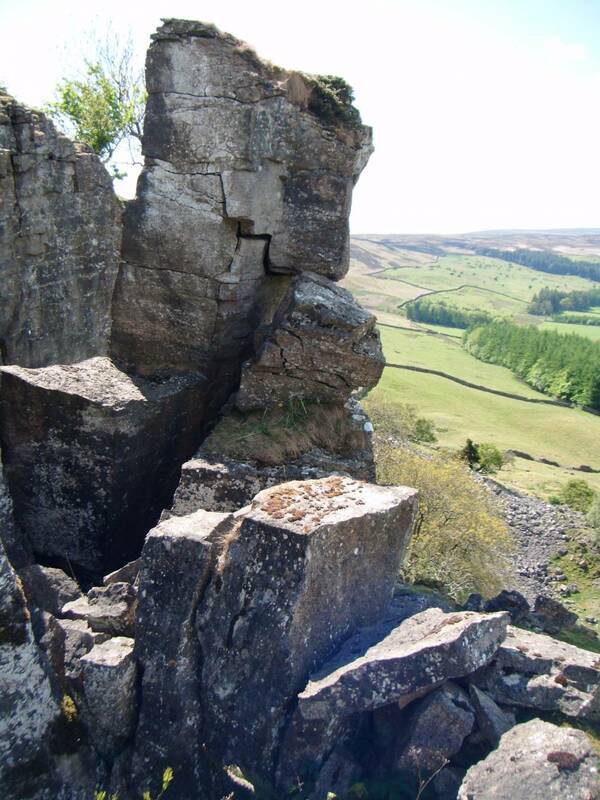 Record Name Ellerton Scar. Two junipers (J. communis ssp nana) on detached stack. Record Description Ellerton Scar is rarely visited and probably relatively unknown to the visitor and Swaledale resident alike, in truth the jungle of Borneo is probably more familiar to the general public than is the yew woodland on and below the limestone scars of Swaledale. 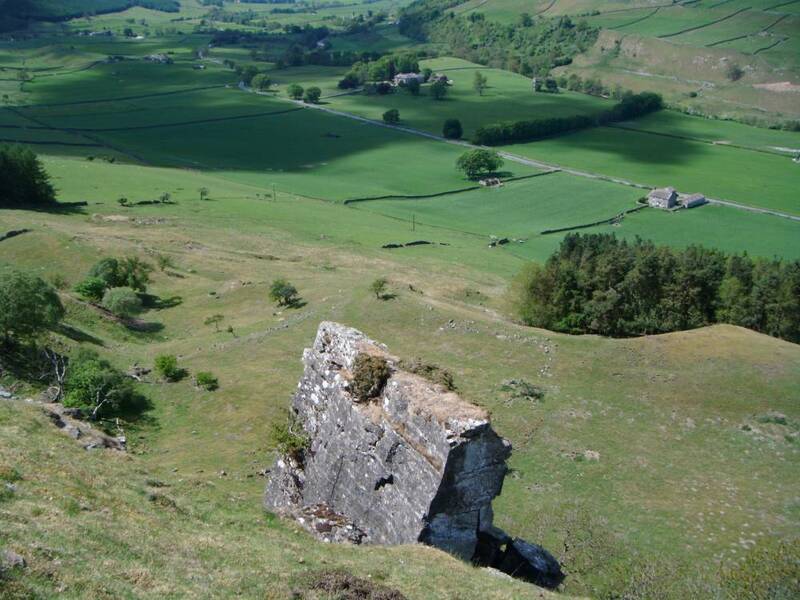 Ellerton Scar itself is on private land and forms the northern boundary of the Army Range. Walkers on the permissive footpath above the Scar may pass by without noticing this beautiful cliff below with its fine woodland. Four distinct zones of Ellerton Scar are recognised, each with its own distinctive woodland community. 1. The uppermost fringe of the cliff. See photo ELL.S1.4 Yews and ash are co dominants but with wych elm, oak (on chert strata at the eastern section of the cliff) hazel, rowan, holly, elder, blackthorn, sallow. 2. The face and base of the cliff. See photo ELL.S1.5 Again, yews are co-dominant with ash and yews occasionally form a closed canopy at the base of the cliff. 3. The limestone scree. See photo ELL.S1.6 Scattered yew, ash, elders, birch. 4. The consolidated lower talus slope and the kame terrace. See photo ELL.S1.7 Open birch wood with rare oak and holly. Birch does not grow on the face of the limestone cliff, it is present on the overlying chert strata. The well define kame terrace below the scree is fully vegetated grazed grass pasture on mixed glacial clays, sands and gravels which have slumped at the western end to form a very large solifluction lobe (landslide or rock avalanche, see Google Maps image) well seen above Scar Farm at NGR SE086 968. Additional Notes If confirmed, this will be the first record for J. communis. ssp nana in Swaledale. Dwarf juniper may also be present on Oxnop Scar and elsewhere in Upper Swaledale. Image 1 Description J.comm ssp nana (two) on detached limestone stack. Image 2 Description J.comm ssp nana (two) on detached limestone stack.